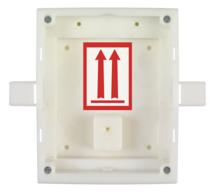 IP RFID and NFC reader, the 2N® Access Unit, combines all standardly used equipment - such as conventional readers, door controllers and IP converters into a single device. This makes both installation and operation of the access system as simple and low-cost as possible. 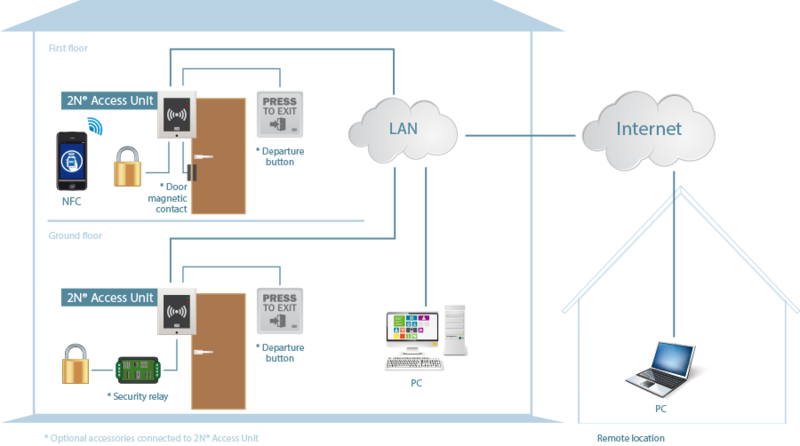 2N® Access Unit is powered via PoE and it directly controls the door lock that can be connected via a security relay to increase the security. If necessary, you can easily connect other devices to it, such as a departure button, open door detector or input from the security centre. Naturally, a camera system can also be connected to 2N IP intercoms. In this way, the customer gets a comprehensive security solution. 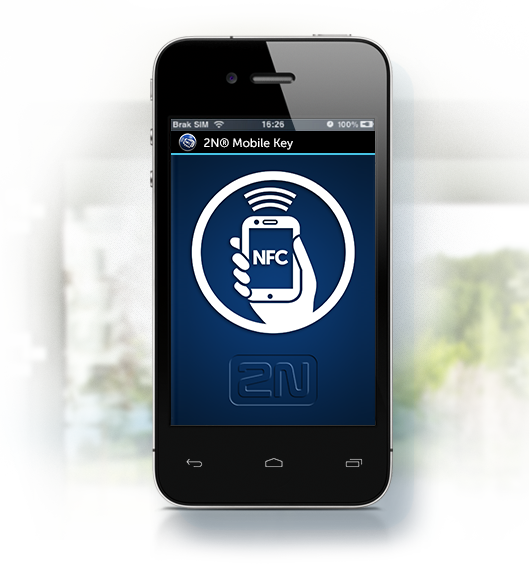 The 2N® Mobile Key software application transforms your mobile phone into an access card allowing you to enter a building. Your mobile phone will thus work like an RFID card. 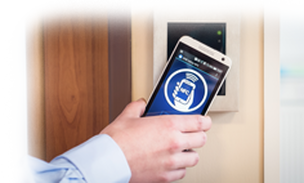 When entering the building, like a standard card, you place your phone against the 2N® Access Unit. Effective administration of access systems	2N® Access Commander is intuitive software for administration of your access system, IP intercoms and attendance system from 2N. It combines simple installation, intuitive control and a web browser interface. This device will identify you on this basis and allow you access to the building. In addition, you don’t have to go through a complicated set-up process with the 2N® Mobile Key. All you have to do is download the application and allow it to run in the background. The 2N® Mobile Key application is designed for all smartphones with Android system version 4.0 or higher. In order to work properly, the mobile phone must also support NFC (Near Field Communication) and HCE (Host Card Emulation). Use it in combination with 2N IP door intercoms with an NFC-ready card reader or with a 2N® Access Unit. An NFC licence must be purchased for operation on these devices. It is installed on a virtual server and allows access to the settings via any mobile device or desktop computer. This means there is no need for each user to install the app on his or her own computer. In the 2N® Access Commander, each user has access only to those services that are intended for him or her according to his or her allocated role. The user is not disturbed by other elements that he or she does not use and that are intended for instance only for admin. Admin also has access to an easy-to-follow tutorial providing simple step-by-step instructions on how to set all the necessary parameters. Therefore, there is no need to study any manuals or attend time-consuming training sessions. ​IP αυτόνομη μονάδα access control 125KHz card RFID reader. Για χωνευτή ή επίτοιχη τοποθέτηση με το αντίστοιχο πλαίσιο & κουτί. Πλαίσιο για χωνευτή τοποθέτηση. Απαιτείται και κουτί 9155014. Κουτί εντοιχισμού για χωνευτή τοποθέτηση. Απαιτείται και πλαίσιο 9155011. Κάρτες εγγύτητας Mifare Tag 13,56 MHz για Helios IP VERSO. Μπρελόκ εγγύτητας Mifare Tag 13,56 MHz για Helios IP VERSO​.